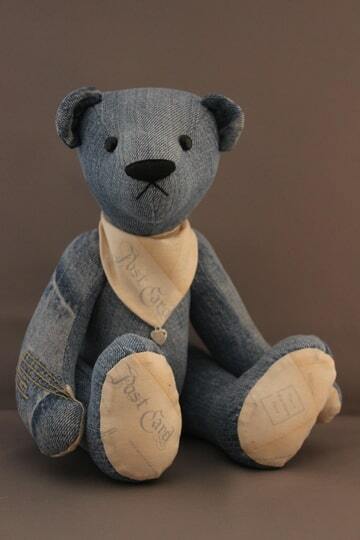 I have made two limited jeansbears for the USA. The first bear is a boy, named Tom. Tom is made of an old jeans in combination with a light yellow quilt fabric with post design on it. On his neck he has a handkerchief from the same fabric with on the end a tag with.....made with love.... He has a hand stitched black nose and black german glass eyes. Tom is five way jointed and filled with synthetic fabric and little steel pallets. I really like to make bears from fabric that is different, not common. With jeans it is really a sport to cut the pattern out of the jeans so that you ar getting a very special oncommon bear. Each jeans bear is different because there are all sort of jeans, and in what for state the jeans is, is also a great part of how beautifull the bear will be. Hope you like my jeans bears, hope you like Tom! !